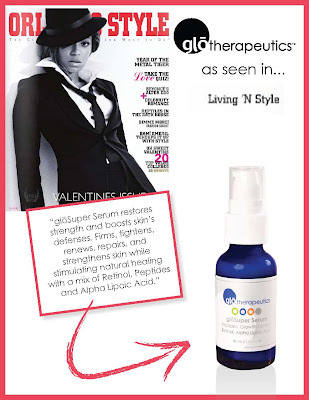 glo Beauty Blog | Makeup How-to's & Skincare Tips: gloSuper Serum for "Living 'N Style"
gloSuper Serum for "Living 'N Style"
Orlando Style magazine featured gloSuper Serum in its 'Living in Style' section in February! They write "glōSuper Serum restores strength and boosts skin’s defenses. Firms, tightens, renews, repairs, and strengthens skin while stimulating natural healing with a mix of Retinol, Peptides and Alpha Lipoic Acid.” Well said, Orlando Style!